Wish I had more time to chat with you today. But I am pushing it even trying to crank this one out. Sam is starting to make some movement in his rock n’ play so it’s only a matter of time before he will be demanding milk. But when you see this recipe, you will be fine with very few words. French toast casserole typically gets my ears perking up. And this one is gonna be perfect for your holiday brunches or just a morning at home with the family. Have it your way! I have a couple baked French Toast recipes. 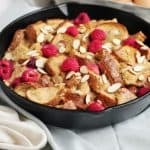 I love this Raspberry Almond French Toast Casserole as well as this fall inspired Pumpkin Pecan Baked French Toast. But this new recipe, with juicy spiced pears is definitely my very favorite of all. Well, until another comes along because I am pretty sure that’s what I said about the other two recipes when I shared them. Just always have to one up it every time! The thing about baking French Toast is how easy it is. Tear up a bunch of bread, pour egg mixture on top, soak for a few minutes and then bake. That’s about it! Less mess and less work than regular French Toast and almost dessert like with a bread pudding like texture. If you love bread pudding, then you will love it. And everyone at the table for sure! You can make this egg free with a combination of flax and milk. Use the same amount of milk but with 5 tablespoons of flax meal. And then make sure to allow it to chill for about 15 minutes. That should do the trick! PS: I did not type fast enough. There was a definite milk break for the little guy before I got this to you. And plenty of snuggles as well! Cut or tear bread into small, 1-2 in. pieces and add to a 2-3 qt. greased casserole dish. Cut pears into bite sized pieces and mix in with bread. In a bowl, whisk together eggs, milk, cinnamon, maple, and vanilla. Bake for 30 minutes or until bread on top is browned and egg is cooked through. Cool for 5-10 minutes and then serve with warm maple syrup and fresh cranberries. For egg free, sub the eggs for 5 T flaxmeal and allow to chill before pouring over bread for at least 15 minutes. This sounds delightful! Would make a perfect Christmas morning breakfast. And I love that it will work with flax “eggs”! Yes! It does, just gotta really allow it to set! This sounds delicious. I’ll have to make this over winter break! I’m always too lazy to just make a single piece, so this idea is exactly what I needed!! Pinning so I can remember it for family get togethers or post long run! It’s really easy and less mess I think! Made this morning with a loaf of gluten free bread. It was amazing… no leftovers. 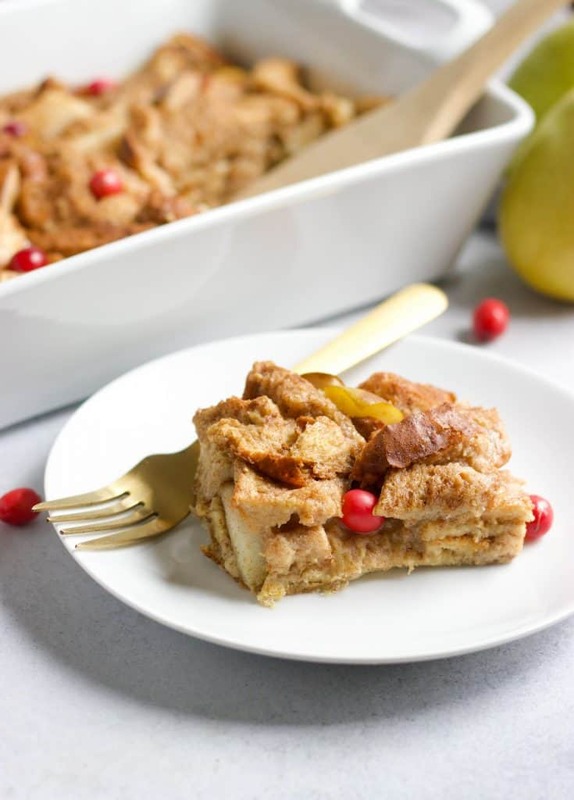 I had to call it “spiced pear bread pudding” since my daughter thinks she doesn’t like French toast. Ha! 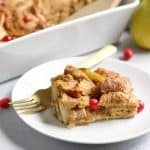 So glad it worked out–maybe that’s what I will tell my husband because he loves bread pudding! Thanks for sharing, Mike. Yum! This sounds like the perfect holiday breakfast for a big group. 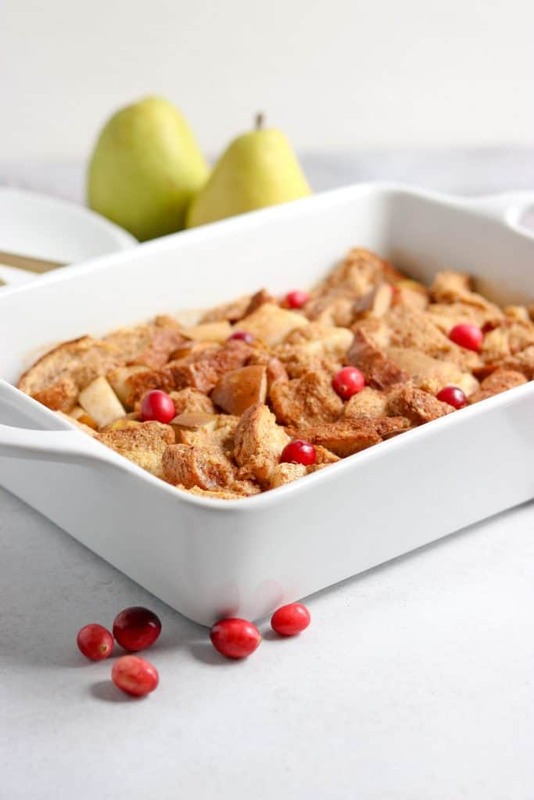 I love the combo of pears and cranberries – such a delicious mix! So much more festive that way I think! Having this for breakfast would be a great way to start any day! I haven’t made baked french toast yet but I definitely need to try! This combo sounds lovely. It’s one of our faves!! Love these lovely seasonal flavors together, so good! This was the best weekend breakfast!! Everything tastes better on the weekend though right?! I love the egg free option! Thank you for this yummy brekkie! Not everybody can do eggs so it’s nice to know you can enjoy without! 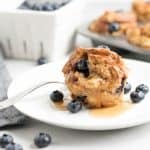 I’m always looking for new, easy morning breakfasts and this was a winner! My entire family loved it and it was delicious! Yay! I love hearing this Meme! Ooh! 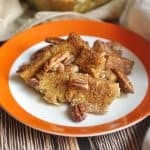 Like a bread pudding but for breakfast! I made this for my boys this morning and they were thrilled! And the house smelled yummy, a perfect Saturday combo!